The interesting thing about boxed sets sometimes is, if you’re not familiar with a particular filmmaker, they offer a crash course in his or her themes and style. You can build a foundation, either creating a starting point for further exploration (example: other Eclipse bundles like Early Bergman [review] or The First Films of Samuel Fuller [review]) or provide a broad overview, leaving you to fill in the gaps later (The Essential Jacques Demy [review 1, 2, 3, 4, 5, 6]). With Japanese director Keisuke Kinoshita, my only prior experience had been with Twenty-Four Eyes [review], his 1954 film about a small-town schoolteacher. It was an assured drama lacking in histrionics, focusing instead on the common and, arguably, the banal--though, the “everyday” might be a more accurate term, as the small things are given equal weight to the stuff of bigger film narratives. One can immediately see the roots for that kind of storytelling in Kinoshita’s initial films, collected here under the banner Kinoshita and World War II. 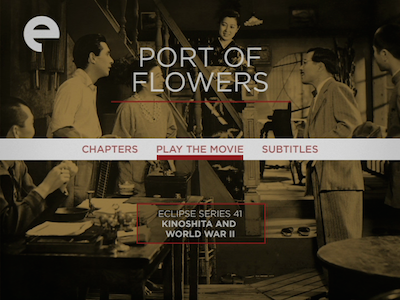 Indeed, the five films in this, the forty-first Eclipse collection, were made during and just after the war, and reflect Japanese life as it was being lived at the time. 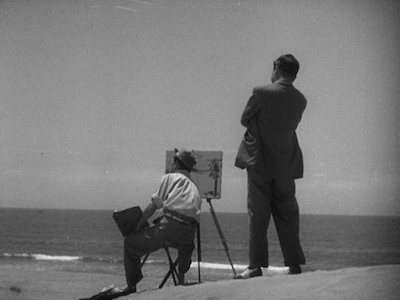 The lead feature is 1943’s Port of Flowers, a seemingly light-hearted movie about two inept con men descending on an island town in hope of bilking the residents out of their hard-earned money. 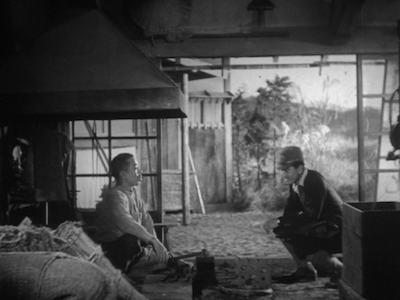 Shuzo (Eitaro Ozawa, When a Woman Ascends the Stairs [review]) and Tomekichi (Ken Uehara, Mr. Thank You [review]) mistakenly try to pull the same ruse. Having discovered that, at one time, an industrialist tried to build a shipyard in this village, only to have the Great Depression wash his dreams away, both men arrive within hours of each other claiming to be the son no one knew the industrialist had. Rather than blow the scheme, the two crooks pretend to be brothers, finding that the love the village had for their alleged father is so great, they are more than willing to believe anything. They are also more than willing to drop every yen they have to help make the shipyard a reality, and before the con artists realize, they have more cash than they know what to do with. These small-time operators are not prepared for a big score, and fear that they’ll only mess it up. Add to that the charms of village life, and particularly the island women, and they start to have second thoughts about disappearing with the bounty. Up until this point, Port of Flowers is fairly innocuous, offering only a slight social critique, particularly in relation to a young woman who had left the island in search of a more cosmopolitan existence, only to be sent back under questionable circumstances. There is also a division made between her brother (Chishu Ryu, Equinox Flower, Late Autumn, etc. [reviews]) and the other villagers, as he was able to go to Tokyo and attend college (an accomplishment the con men can’t even claim). Education is poised against traditional values. In its early stages, I assumed Port of Flowers was heading toward State and Main territory: the self-important city folk would find themselves taken advantage of by the country bumpkins. That all changes on December 7, 1941. Following the attack on Pearl Harbor and the expansion of the war, a nationalistic surge takes over the town, and the con men find themselves swept up in it. If they can build a ship for real, the country could use it, and they can serve in their own small way. 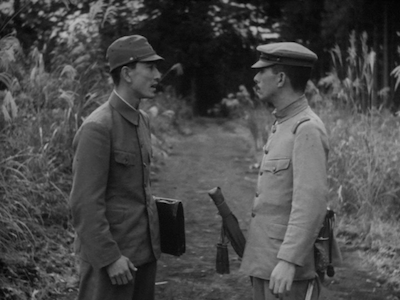 It’s fascinating to see a story about Japanese patriots during the conflict, particularly as the war was still going while Kinoshita was making his film. Had Port of Flowers been made even a couple of years later, the drama would have a different tenor. As they say, the victors get to write history, and so most Japanese stories that followed show the regret and misgivings that were deemed appropriate in peacetime. Think of how some American pundits reacted to Hayao Miyazaki’s The Wind Rises [review] last year because its main character never questioned how the planes he was building would be used, and then imagine Port of Flowers being released today. Doesn’t it make sense that the Japanese citizenry would want their country to thrive and prosper and ultimately win? It’s no different than what Clint Eastwood was trying to do by leaving the politics out of American Sniper [review], and look how that turned out. The thing is, there are no politics presented here, no anti-American or European rhetoric, just average folks seeing the direction their nation was heading and trying to do their part. Kinoshita avoids making the movie propaganda in this way, as opposed to say the straight-up rallying in something like Powell and Pressburger’s 49th Parallel [review]. While Kinoshita did have to get the approval of the government censorship board before making Port of Flowers, it doesn’t feel like he was being swayed to deliver a particular message. Though, if he had to cut some things here or there, that might explain the abruptness of the ending. Without giving too much away, the con men disappear from the island before the ship they caused to be built is launched--and, indeed, on the same day some of the local fishermen are attacked by Allied submarines--without much explanation. We can fill in some of the pieces, but not to any exact detail. It’s almost like a reel, or at least a scene or two, is missing. But then, if there is anything to quibble over in Port of Flowers, it’s some of Kinoshita’s clumsy edits. Most noticeable are the times he tries to build tension by quick cuts that are so quick, they are practically subliminal. These mostly involve the local policeman, whom Kinoshita wishes to make an object of fear for his bumbling bad guys. 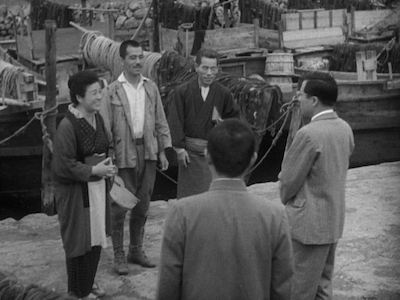 Most of the rest of the movie has a much more patient mis-en-scene, more akin to Ozu, and thus it makes these sudden flashes of Hitchcockian style all the more jarring. That said, the first-time director shows some flashes of ambition that work quite well. The natural setting, including the realistic sets, and the way Kinoshita handles the countryside, including bad weather, shows a confidence learned from his previous years as an apprentice. 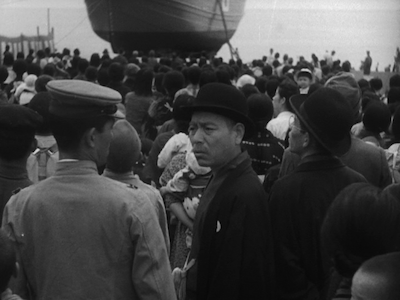 There is also one very effective sequence where the old woman Okano (Chieko Higashiyama, Tokyo Story [review]) relates memories of time spent with the real shipbuilder. She tells the story while on a carriage, and the scenery outside changes from the island view to a rear projection of a life she imagines for herself and her lost love in far away locales. It’s a pretty obvious technique to modern eyes, but it creates a dreaminess that perfectly evokes the feeling of having spent decades pining for what might have been. 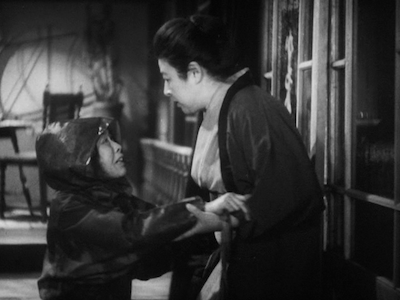 The effect is helped by Higashiyama’s careful performance. It’s a rare moment of vulnerability for a character who otherwise keeps her guard up. She is quite good, as are Ozawa and Uehara. The duo are subtly comic, avoiding going too broad, and thus making the poor intentioned thieves sympathetic rather than pitiable. Nationalism is far less of a subtle topic in Kinoshita’s follow-up. 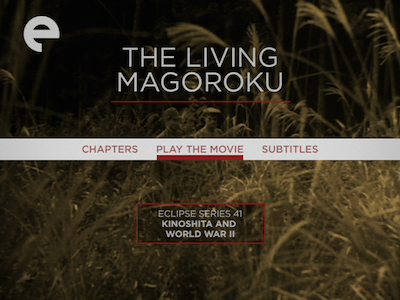 Made the same year as Port of Flowers, The Living Magoroku is a propagandist fable, the kind of thing that might have run as a short subject between the cartoon and the main feature in wartime Hollywood, but here extended to full length. The gist is this: in a rural community, the Onagi family maintains the same farmland that their ancestors fought on nearly 400 years prior. The Living Magoroku even opens with a flashback to samurai clashing on the meadow before cutting to modern-day warriors training for combat in the wilderness nearby. Superstition has left the family’s field untouched all this time. They believe that to break the ground would be to violate the spirits of the ancestors who fell there. The clan is currently overseen by its widowed matriarch (Mitsuko Yoshikawa, Apart From You [review]), who also believes she lost her husband at a young age, as the family has lost all of their men, for even thinking of violating the curse. Her own son, Yoshihiro (Yasumi Hara), believes he is suffering from lung disease. Outside influence is pushing him to cultivate the land, but he is scared. 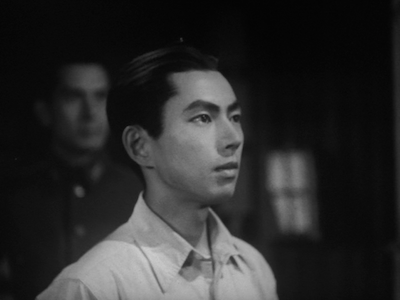 Enter an army doctor (Toshio Hosokawa) and an ambitious sergeant (Uehara). Both are visiting the Onagi homestead for a similar reason. The doctor is looking to buy a vintage sword from the family, as he foolishly sold his own and needs to restore the lost heirloom and his good name; the sergeant believes he also has such a sword and wants it appraised. Between the two of them, they will sway mother and son to do the right thing. The Living Magoroku was written by Kinoshita, as well as directed, and he attempts to stack the narrative, creating an ensemble of characters with similar goals and faults to match the Japanese climate of the period. The Living Magoroku consistently works on two levels, each chafing against the other, its own narrative locked in conflict. Kinoshita seeks a balance between tradition and necessity, superstition and reason, honor and pragmatism. Much like the educated man was seen as the voice of civilization in Port of Flowers, so too does logic and experience hold sway here. Land, armor, and weaponry are all things to be revered, but the battlefield is not as important as the fields where the citizenry lives and eats. Nor is sacrifice made only on the front lines. This is the ultimate thrust of The Living Magoroku: each person must do his or her part, even if they don’t like it. Again, consider American drives for tin and rubber, or warnings how “loose lips sink ships,” the person next to you in this theater may be a spy. It’s not at all subtle, neither in its message nor even in its drama. (And, at its worst, the acting can either be stiff or corny in equal measures; at its best, unmannered and naturalistic.) Still, Kinoshita strives to find the humanity in it all. The personal cost can be repaid, and the group effort leads to extensive bonds. The sergeant strives to unite two young lovers who are unable to marry due to the argument over the land, and the doctor not only restores his family name, but he extends that family when it’s all said and done. 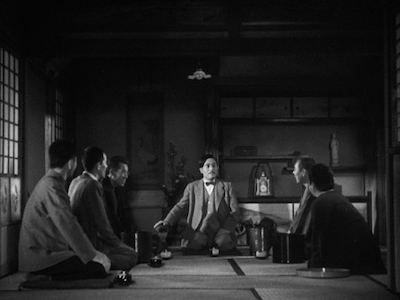 Though the writing seems heavy at times, the overall structure of The Living Magoroku is slick, with Kinoshita confining the action to a few small places, and also isolating the timeframe to two separate visits from both the army men. He also shows an increased movement through the scenes, including elegant pans from one happening to another, like moving from the ground up to spy through a window, creating an overall feeling of connectedness and realism. This is one world he’s operating in, one community. Likewise the visual connections between past and present, the objects and artifacts echoing back to those brief battlefield moments reminding us just how present history is in the day-to-day. This disc was provided by the Criterion Collection for purposes of review. The stills shown are taken from the standard-definition DVD release and not the Blu-ray under discussion.